Congress reaches bipartisan highway transportation infrastructure bill deal. 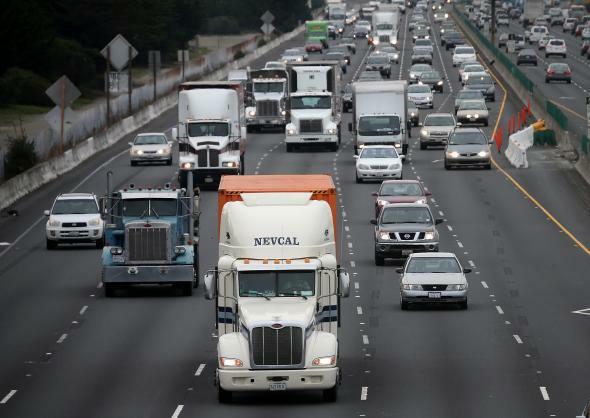 Trucks drive along Interstate 80 on February 18, 2014 in Berkeley, California. Don’t look now but the United States Congress is doing its job. House and Senate negotiators unveiled a bipartisan compromise on a 5-year transportation infrastructure bill on Tuesday that would provide much needed investment in the country’s roads, bridges, railway and mass transit systems. The bill, which would bring some $300 billion in funding with it, seems like pretty standard stuff for a legislative branch of any country, but that’s what’s made Congress so much fun over the past decade—nothing at all can happen at any time. The bill boosts highway spending by 15 percent and transit spending by 18 percent over its duration. It also authorizes $10 billion over five years for Amtrak, $12 billion for mass transit and $1 billion for vehicle safety programs. However, that money is subject to annual spending decisions by Congress rather than being paid for from the federal Highway Trust Fund. The bill still falls far short of the $400 billion over six years that Transportation Secretary Anthony Foxx has said is needed to keep traffic congestion from worsening, and it puts off the difficult decision of how to sustainably pay for transportation programs. The federal 18.4 cents-a-gallon gas tax, the main source of Trust Fund revenues, hasn’t been increased since 1993 and no longer covers annual spending on transportation… The bill is paid for through a series of revenue-raising provisions, some of which have been criticized as gimmicks and budgetary sleight of hand. One of the hallmarks of the bill is the creation of new programs to focus transportation aid on highways regarded as important “freight corridors” in an effort to reduce major bottlenecks and speed the delivery of goods. The House and Senate still need to vote on the bill and are expected to do so this week before it goes to the president’s desk. After years of government shutdowns that have caused the American people to tune out and distrust their elected representatives, the passage of the bill is a welcome sign functionality and an early win for newly minted Speaker Paul Ryan, who pledged to restore some semblance of sanity in the chamber that has been ground to a halt by the Tea Party wing of the GOP.